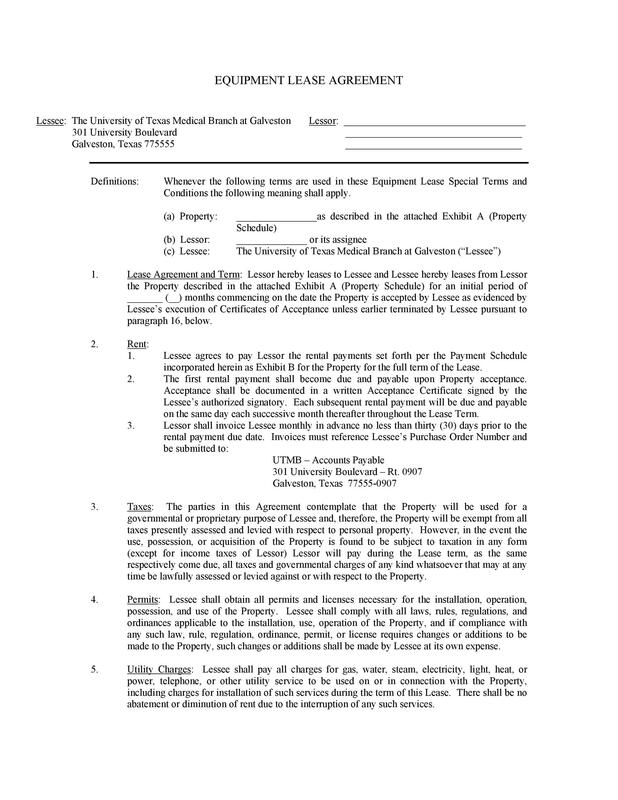 An equipment lease agreement is a type of contractual document. 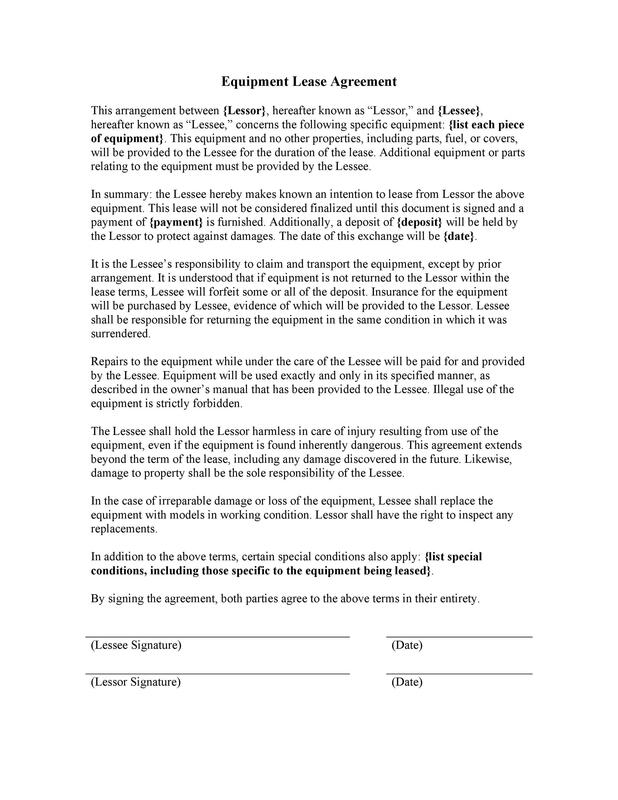 In this agreement, the owner of the equipment or the “lessor” allows a person or company or the “lessee” to utilize the equipment for a specific amount of time in exchange for monetary compensation. 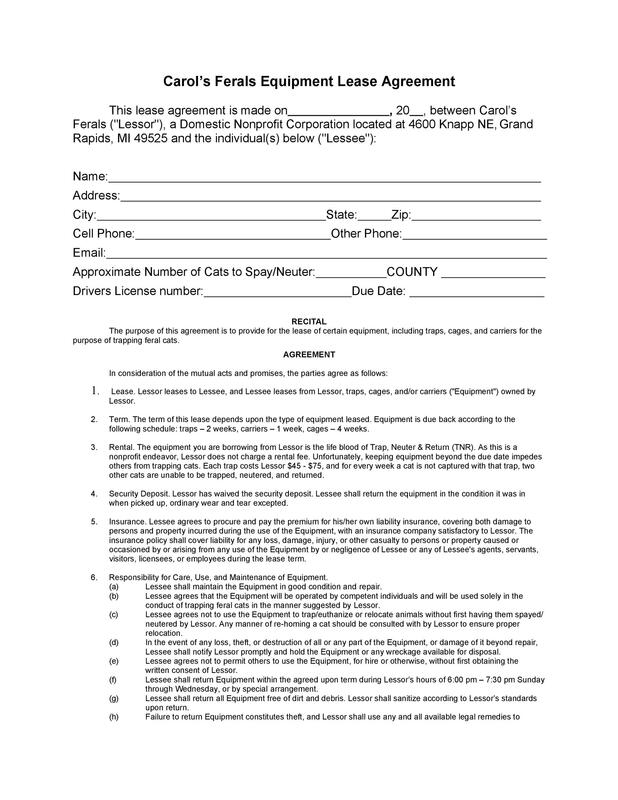 Once both parties agree to the terms of the lease, they affix their signatures to make it official. 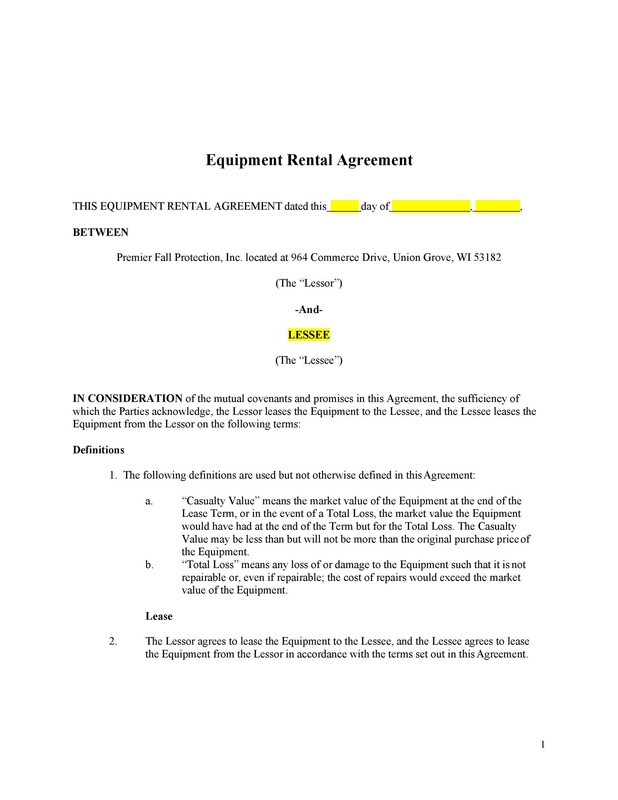 2 What is an equipment rental agreement? 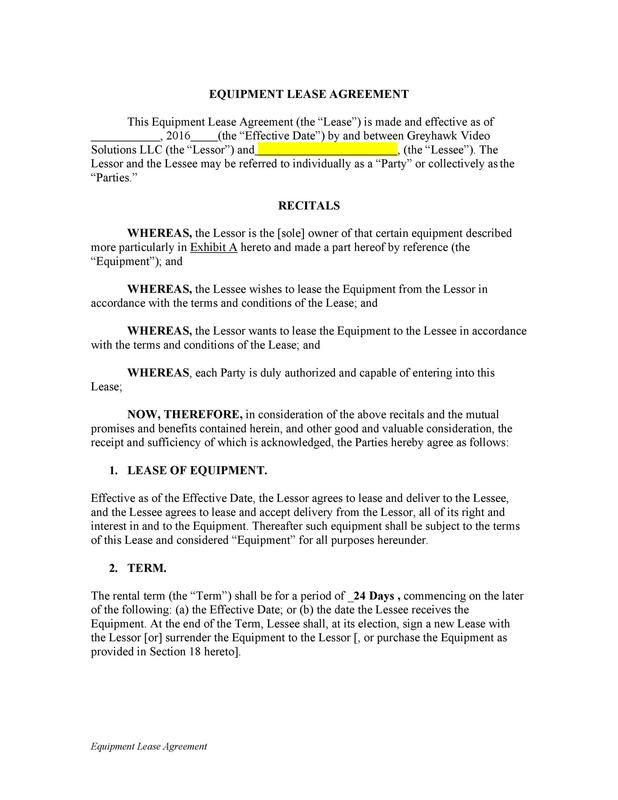 4 Why do companies enter into an equipment lease agreement? 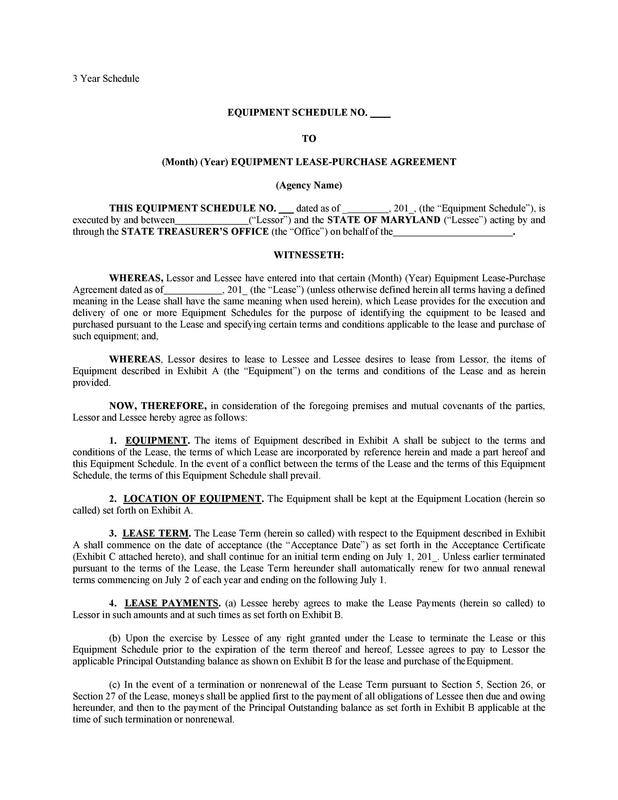 9 How to use an equipment lease agreement? 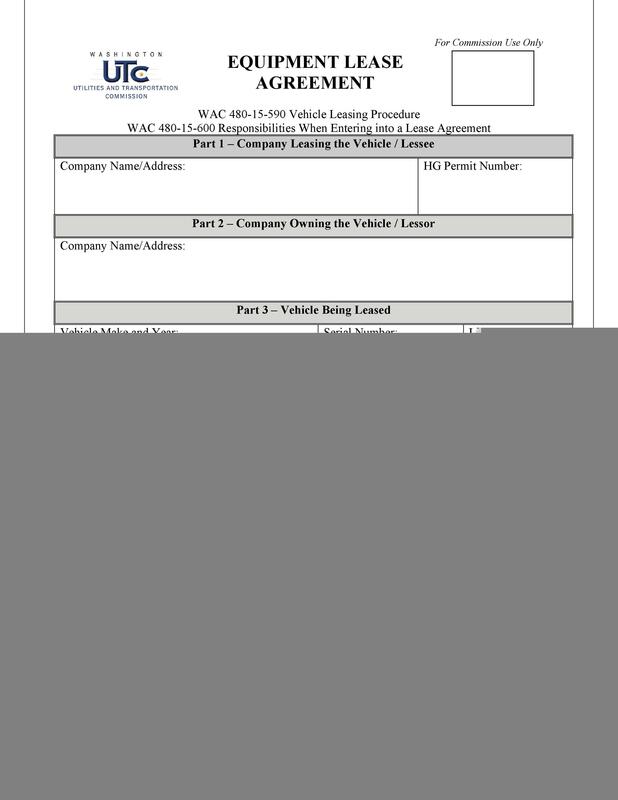 10 How to get out of an equipment lease agreement? 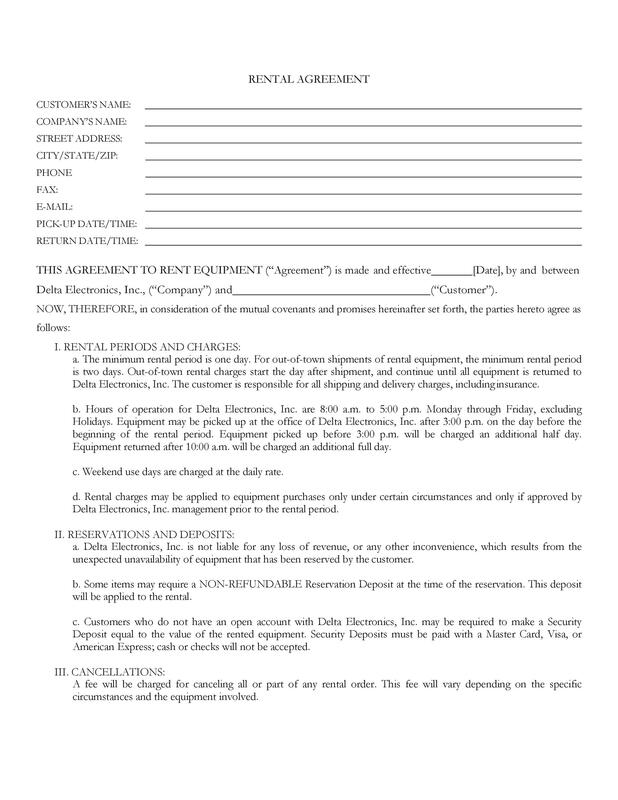 What is an equipment rental agreement? 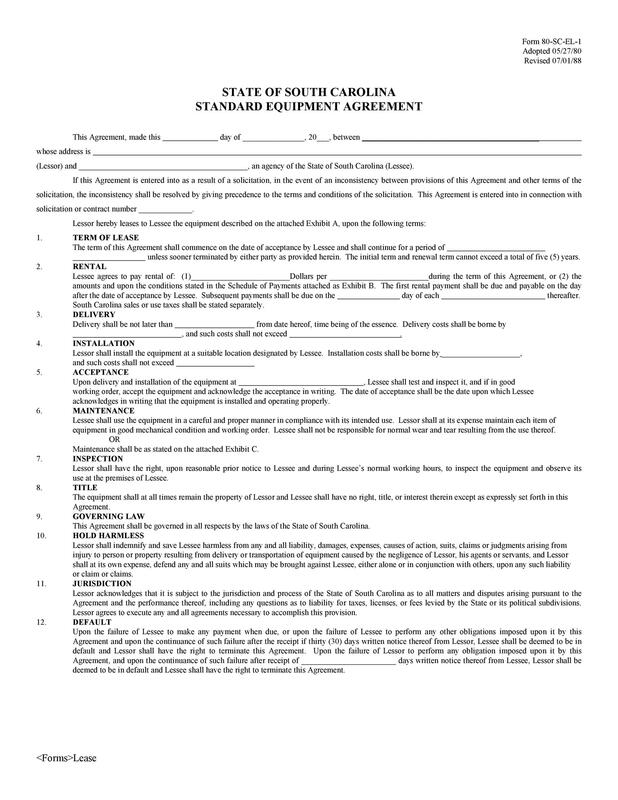 An equipment rental agreement is a contract made between two parties concerning the use of some type of equipment. 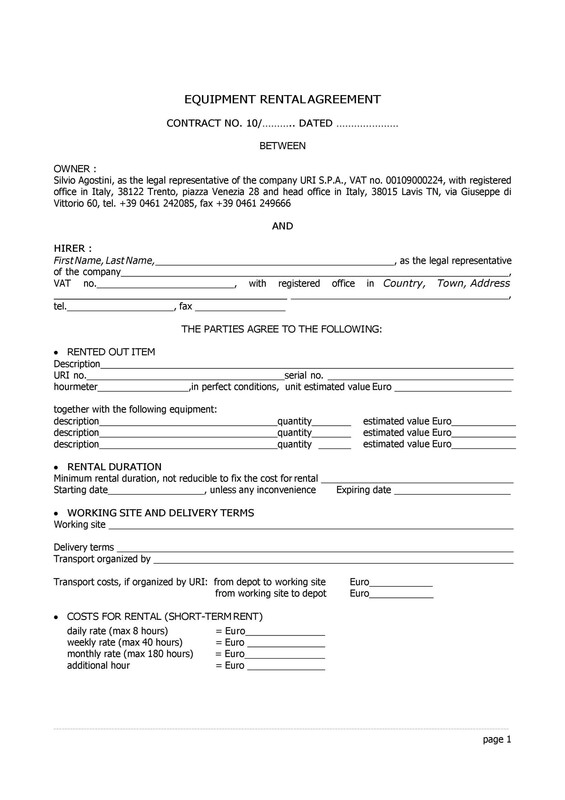 The lessee rents the equipment of the lessor for a specific period of time as stated in the equipment rental contract. 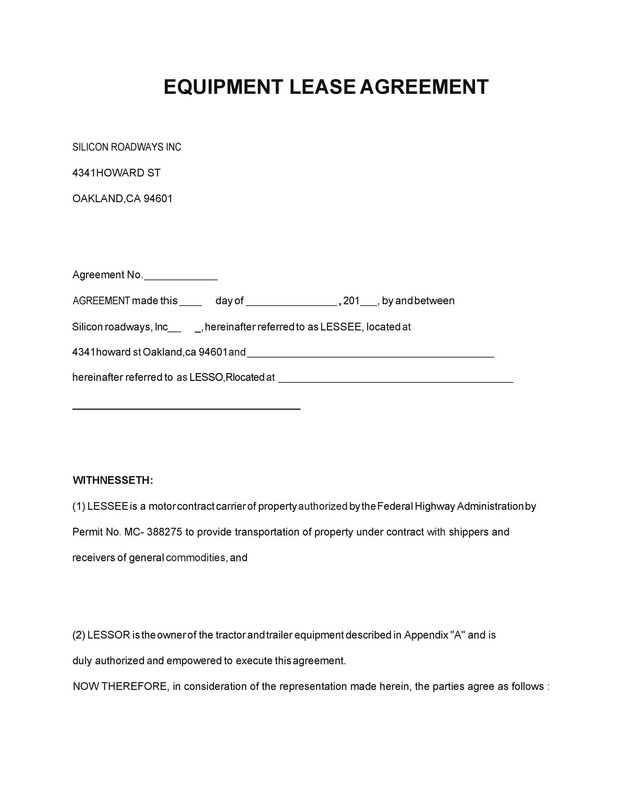 In exchange, the lessee provides compensation to the lessor again, as stated in the contract. 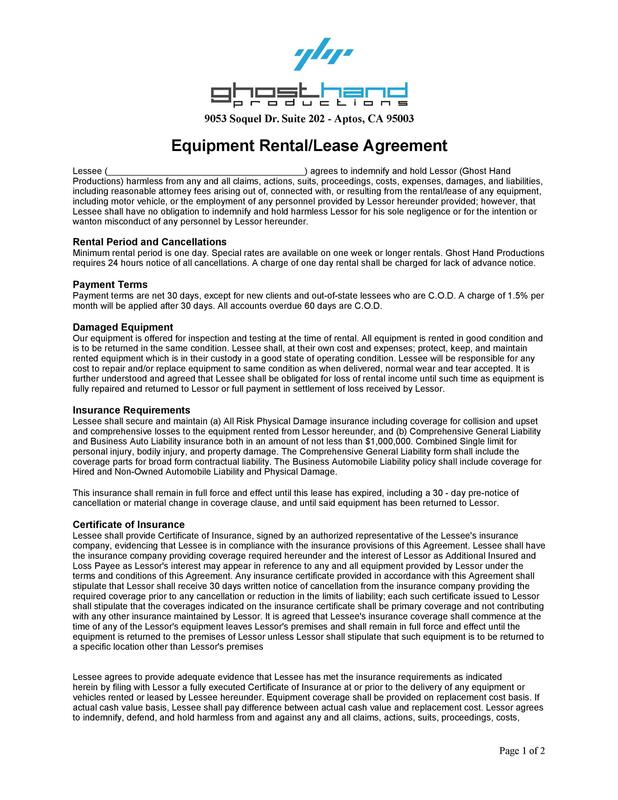 In the case of a short-term equipment rental agreement, the lessor may provide the lessee with a choice to renew the agreement, terminate it or purchase the rented equipment. 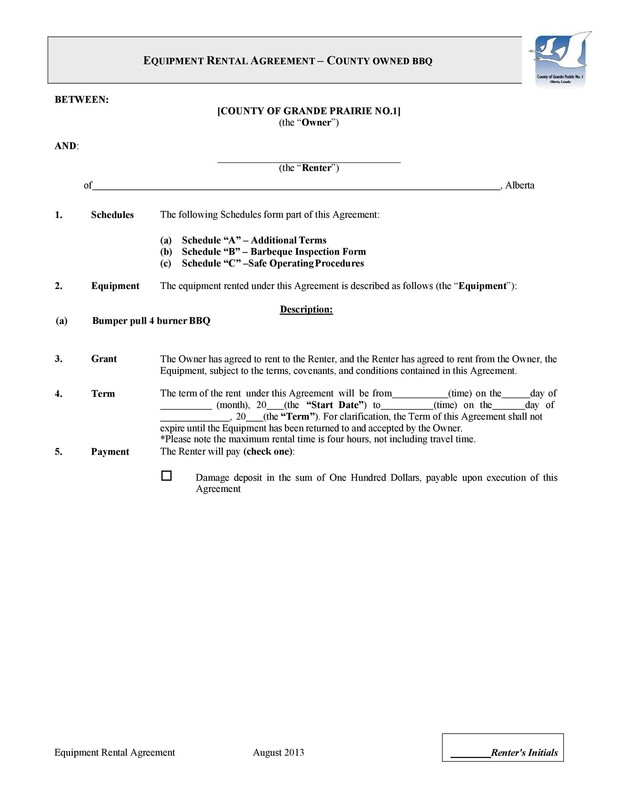 This depends upon the terms of the original agreement made and agreed upon by both parties. 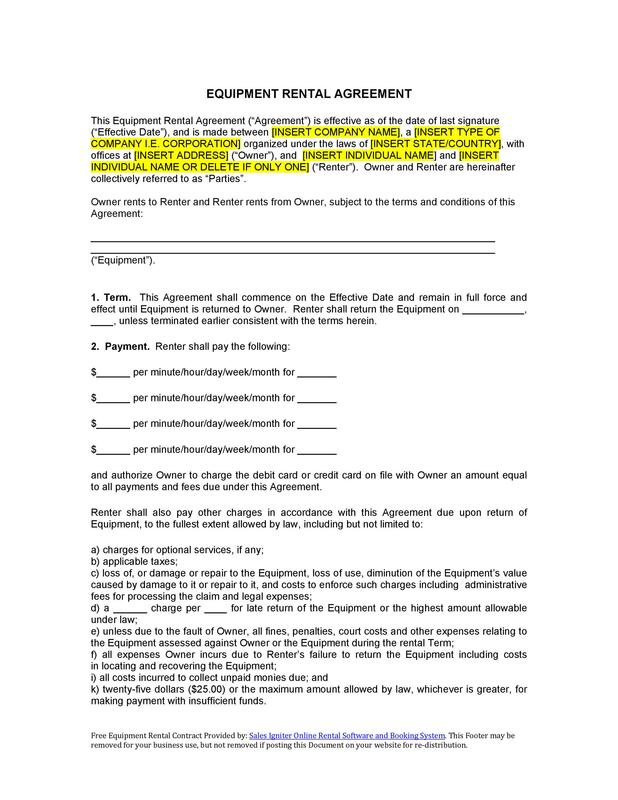 Why do companies enter into an equipment lease agreement? At one point or another, companies need to acquire equipment for their businesses and there are three ways to do this. First, the company can buy the equipment it needs using cash. Second, the company can buy the equipment it needs by taking out a loan from the bank. 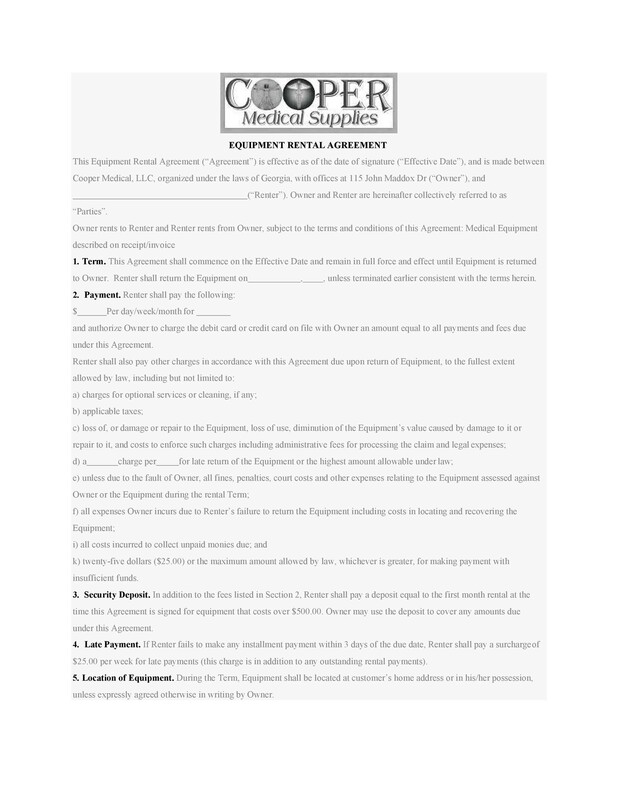 The third option is for the company to enter into an equipment lease agreement so it can rent the equipment for a lower price. Leasing equipment is an excellent way for companies to make upgrades without having to spend too much money. It allows the company to get its hands on the latest technologies at a more affordable cost. In America, over 80% of companies agree to an equipment rental contract so they can lease equipment instead of purchasing it. Because of this, there are thousands of companies which lease equipment to the companies which need them in exchange for periodic compensation. Often, companies don’t have enough money to purchase large, complex machines or equipment which may cost millions or billions of dollars. Therefore, these companies opt to lease the equipment they need for as long as they need it. 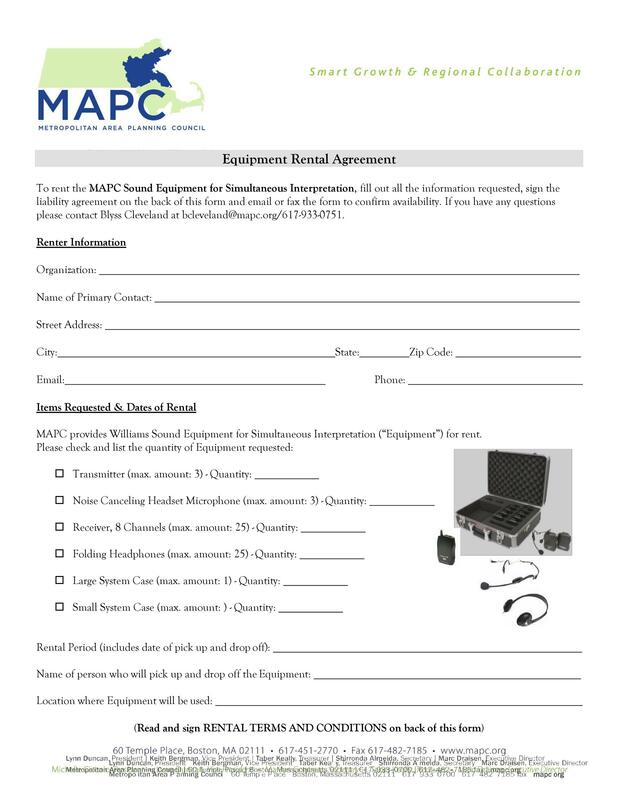 Some examples of leased equipment include computers, telecommunication gadgets, diagnostic tools, and more. 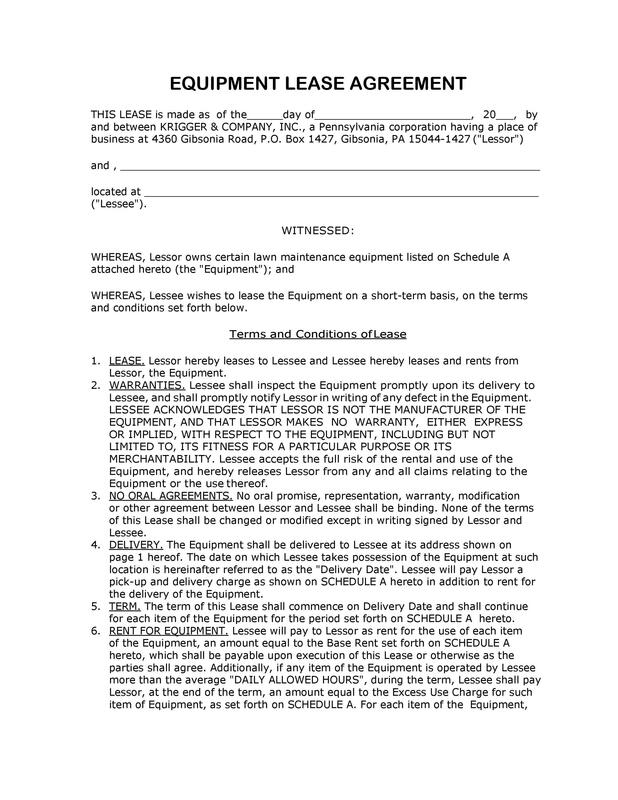 This type of lease is non-cancellable and long-term. 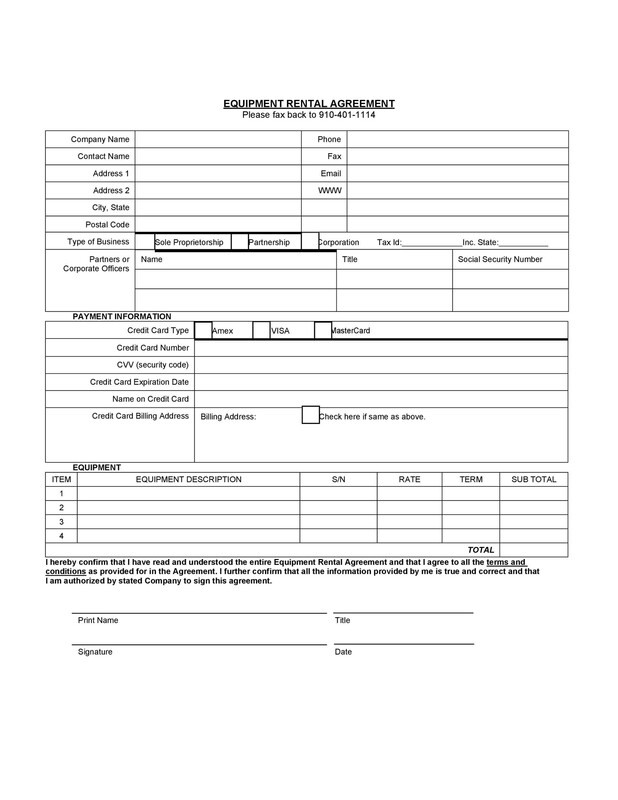 Companies use a capital equipment rental agreement template to utilize a piece of equipment for a long time or when they want to purchase the said equipment at the end of the agreement. 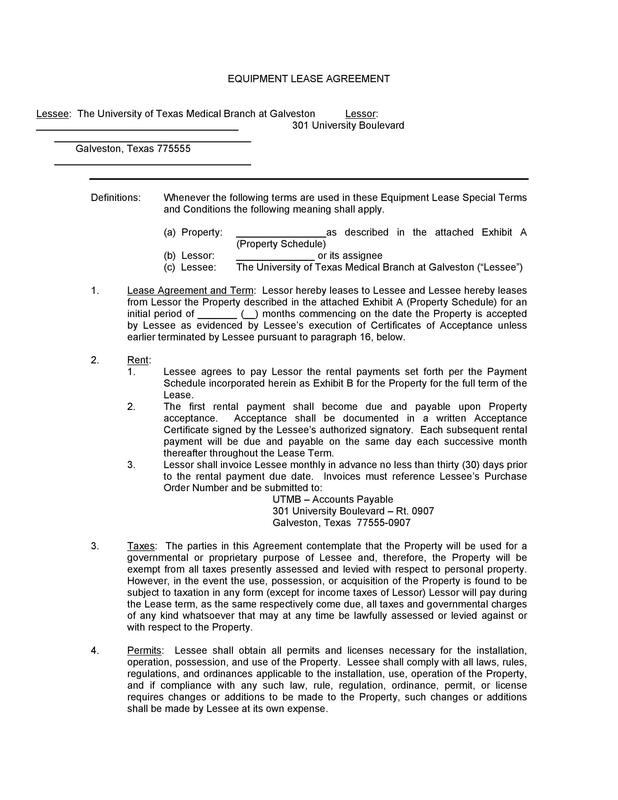 The lessee records any liabilities and assets of the equipment in a balance sheet during the whole lease period. Most businesses opt for this type when they need to rent costly capital equipment which they might have the budget to purchase right away. 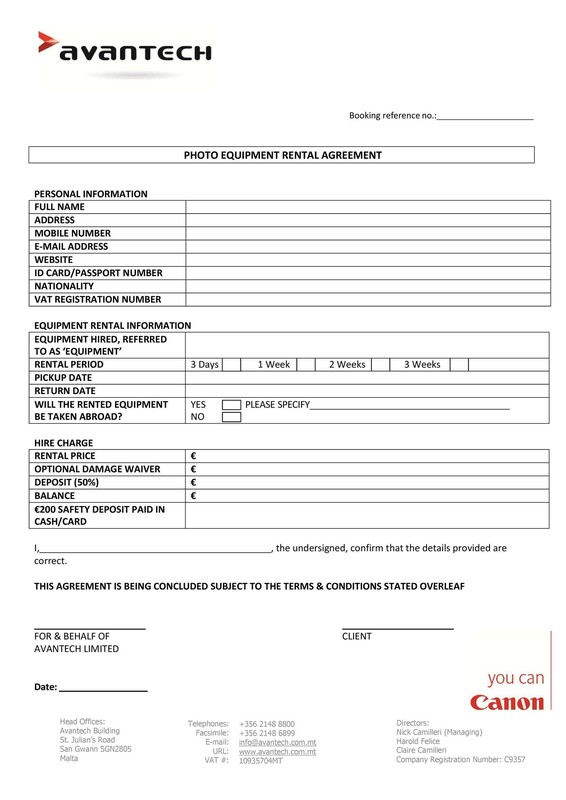 Conversely, this type is a short-term equipment rental agreement which the company can cancel even before the lease period expires. 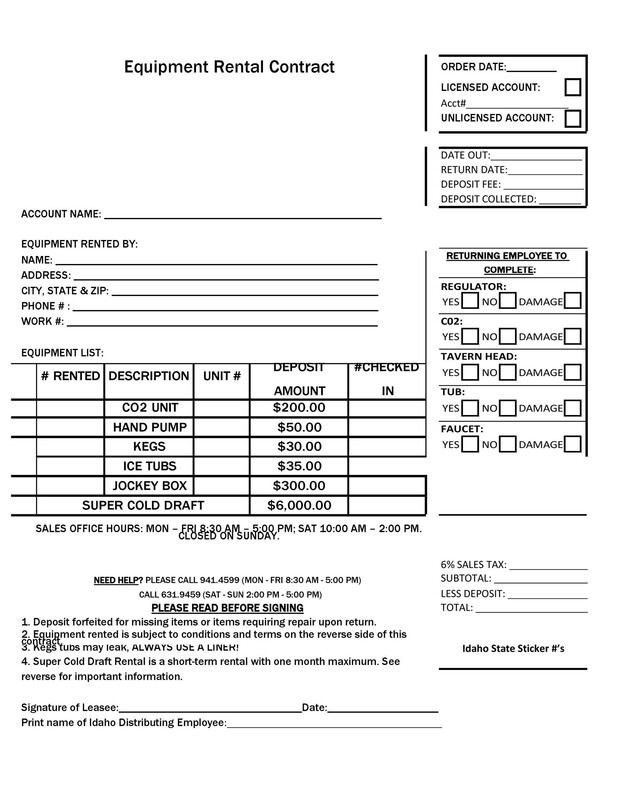 Companies who need equipment for a specific time period only would choose this type of lease. Here, the lessor rents his equipment for as long as the lessee needs it which puts him as a risk of obsolescence. The lessee has the option to cancel the agreement before the expiry. He must give prior notice first and he would have to pay a penalty. 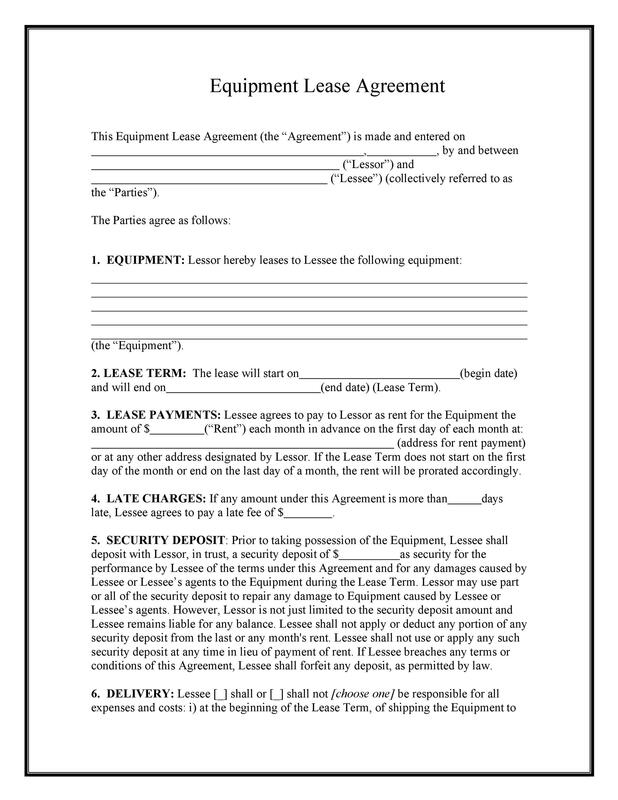 These are the two main types of lease agreements used by companies which lease their equipment. 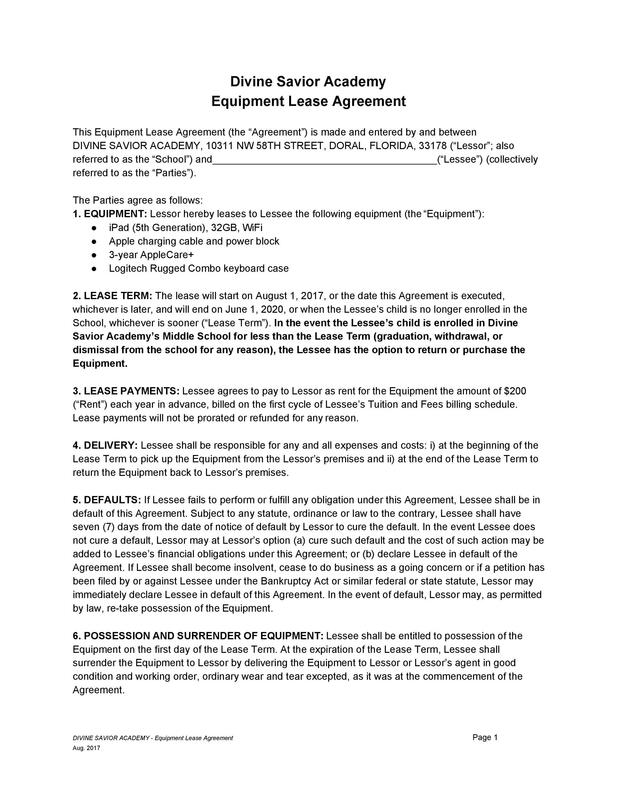 There are other types of equipment lease agreements too which combine the features of these two types. If you need to create a template for your company, think about the needs of your clients and of your company too. This depends on the needs of the company and how much it costs to lease the equipment. For smaller companies who may have to change their equipment frequently, choosing a shorter duration is more favorable. But for more expensive types of capital equipment, a longer duration of the lease is the cheaper and more convenient choice. 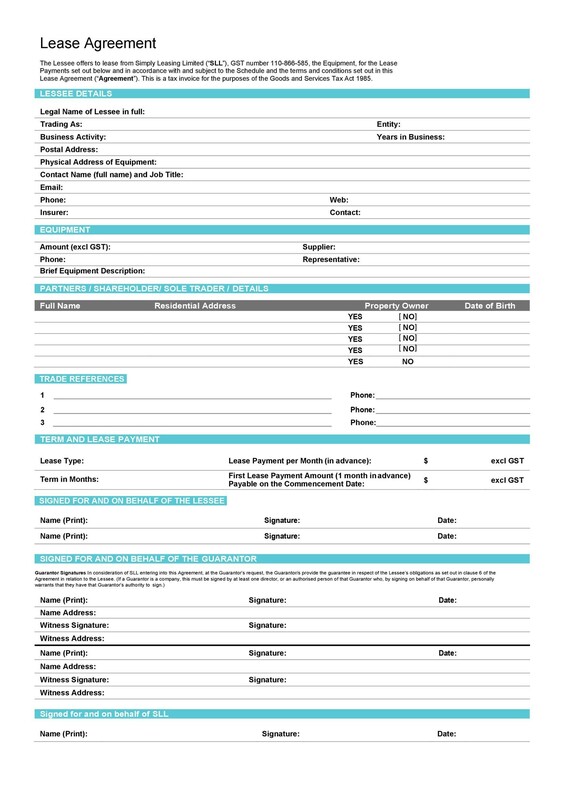 The document must contain the financial terms including the timeline of the payments, the due dates of the payments, fees or penalties, and more. This is an important piece of information to include for the benefit of the lessee. Before agreeing to the contract, the company needs to consider its projected cash flow so they can determine if they can make the payments. These payments get spread out over a number of months until the lease period expires or when the lessee purchases the equipment from the lessor. A lot of equipment for lease are very expensive. 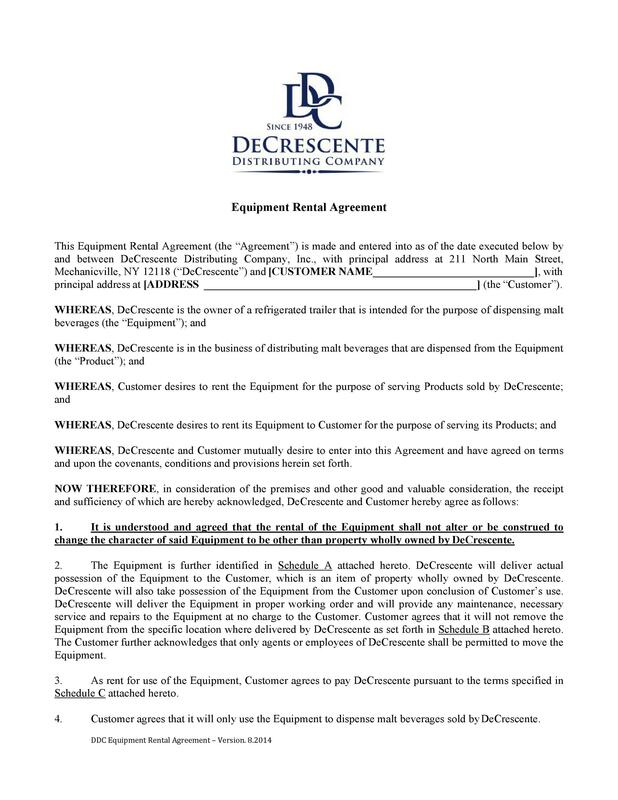 The lessee must understand the market value of such equipment before entering into the equipment rental contract. 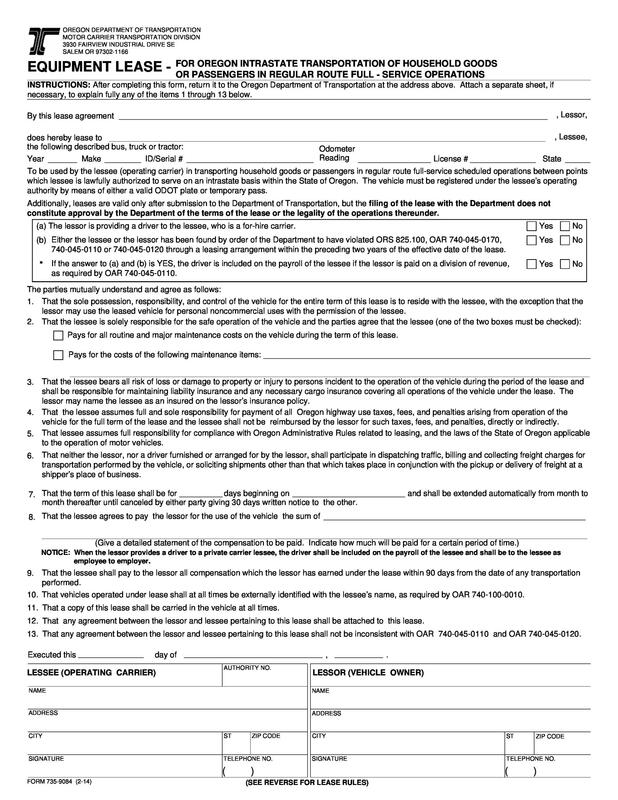 This will help the lessee evaluate any insurance costs to protect himself and his company against the damage or loss of the leased equipment. This depends on the type of lease you create. 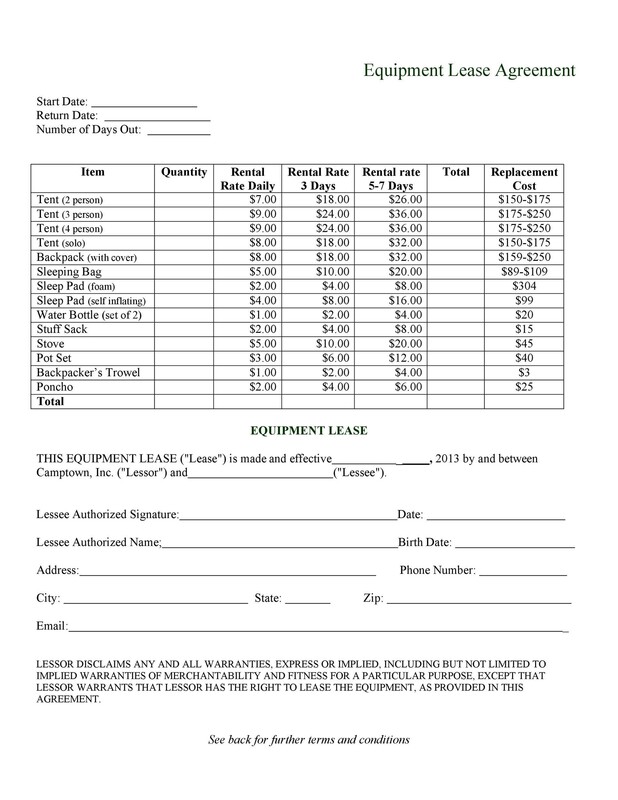 In some cases, the lessee needs to pay a specific amount as tax on the leased equipment. It’s important to include this information for the lessee to know his responsibilities. 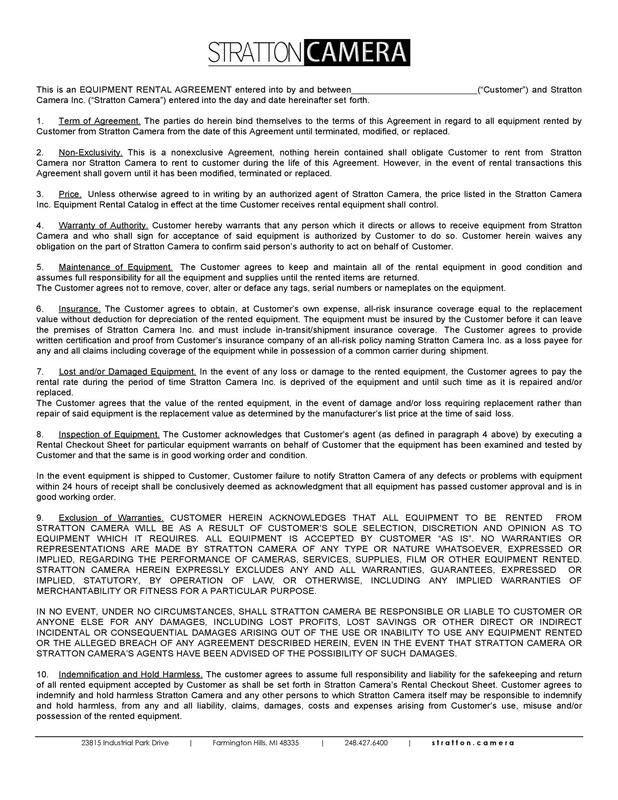 Include any guidelines for the cancellation of the agreement in the template. For whatever reason, the company might decide to cancel the agreement before it expires. Some of the common reasons for cancellations include outdated equipment, defective equipment or when the company finds a better alternative. Most of the time, leasing companies charge the lessee with penalties for cancellations. 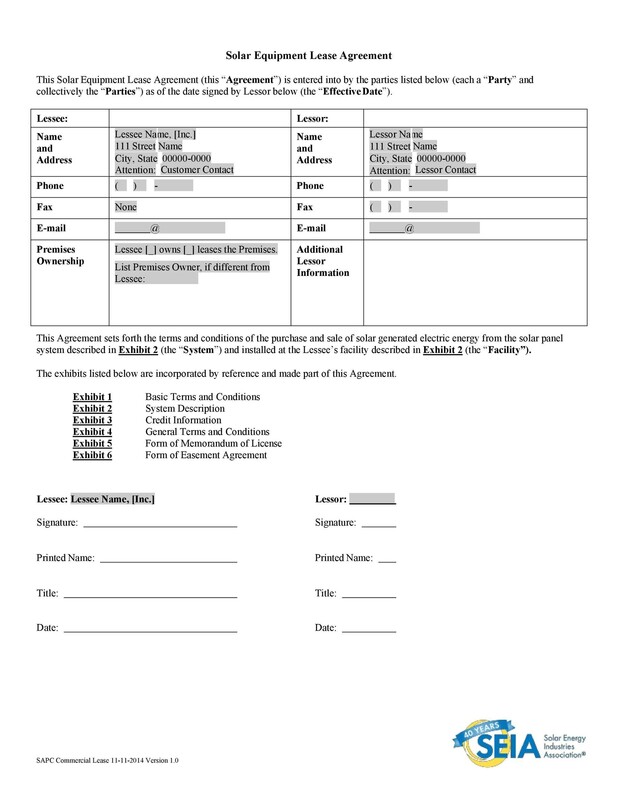 This information must appear in the document for the information of the lessee. These options are the guidelines the lessee must follow with regards to renewal at the lease period’s expiry. The lessee might choose to reduce the periodic payments or purchase the equipment after the agreement expires. 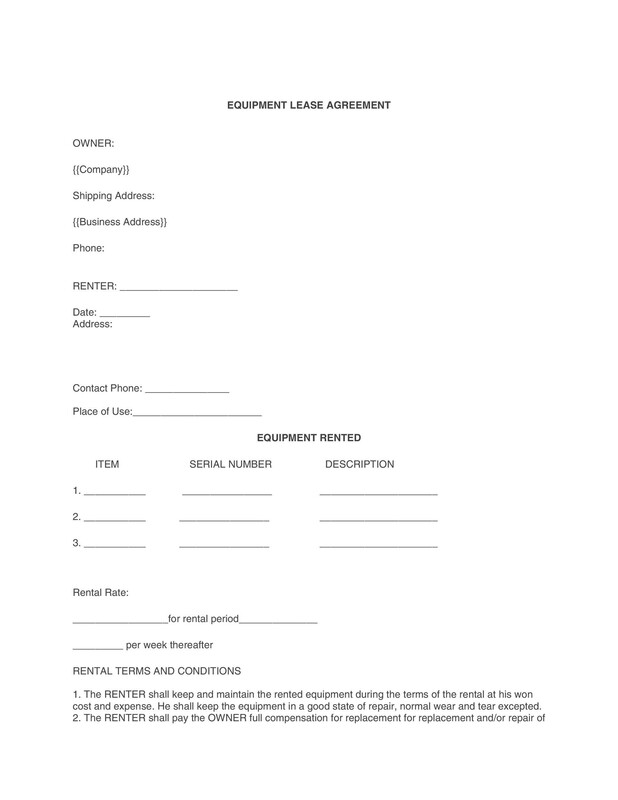 How to use an equipment lease agreement? 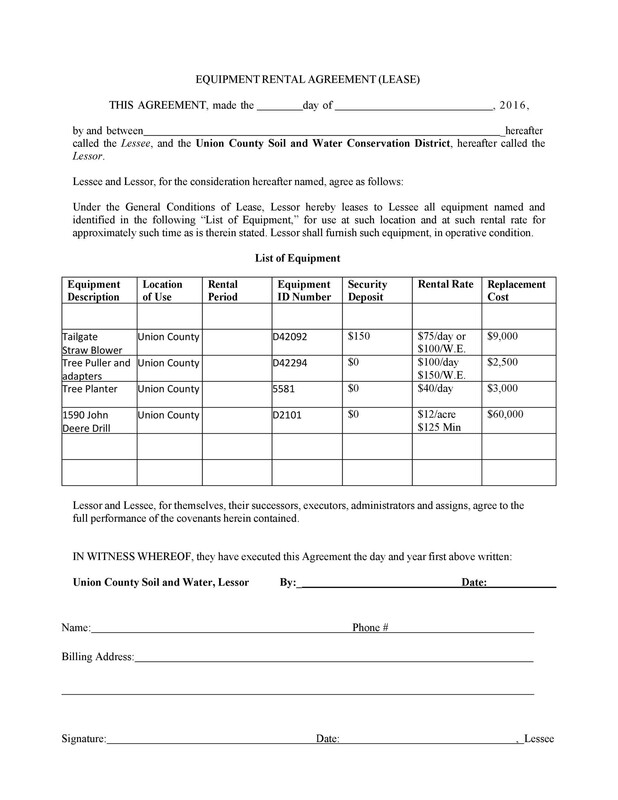 The lessor must create an agreement which includes all of the important information. 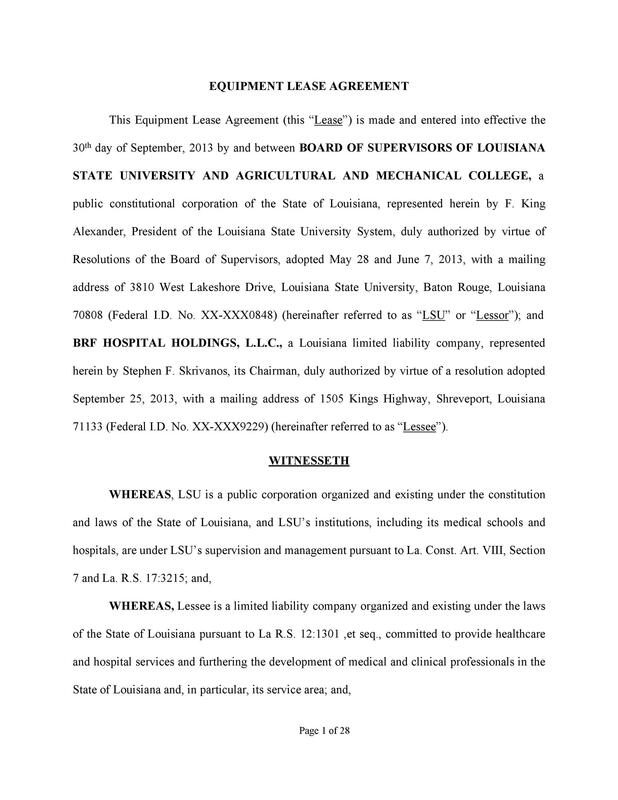 The lessor gives the document to the lessee for review. 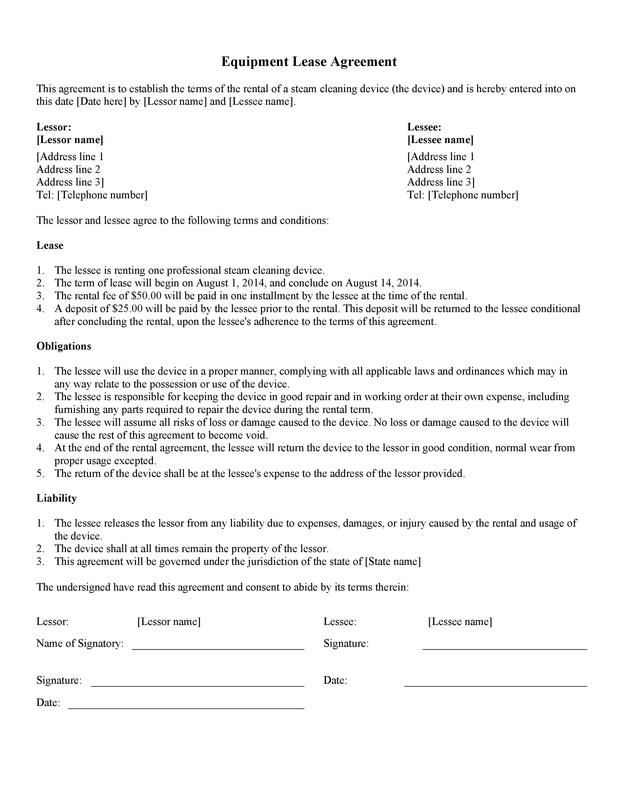 If both parties agree to the terms and conditions stated in the document, they can affix their signatures. If not, the lessor needs to make the required modifications as agreed upon by both parties. 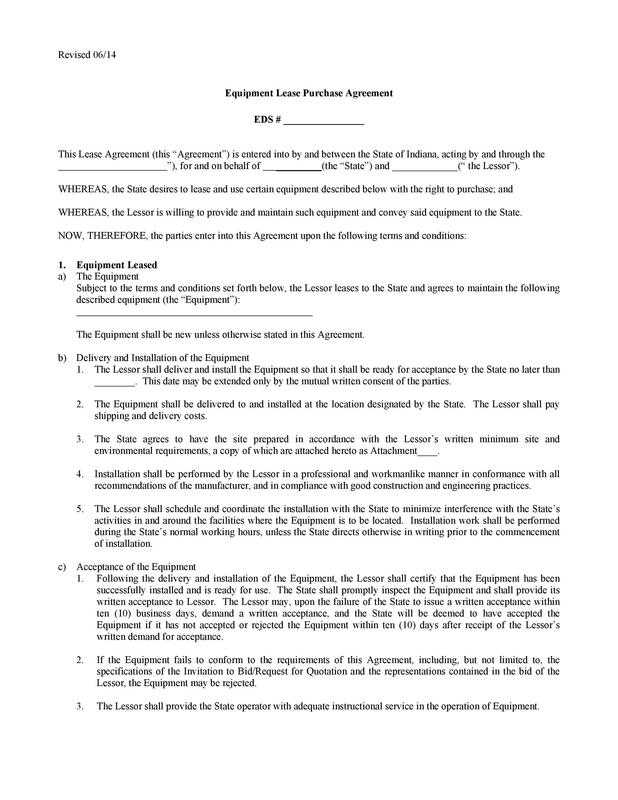 Both the lessor and the lessee must have signed copies of the original agreement. 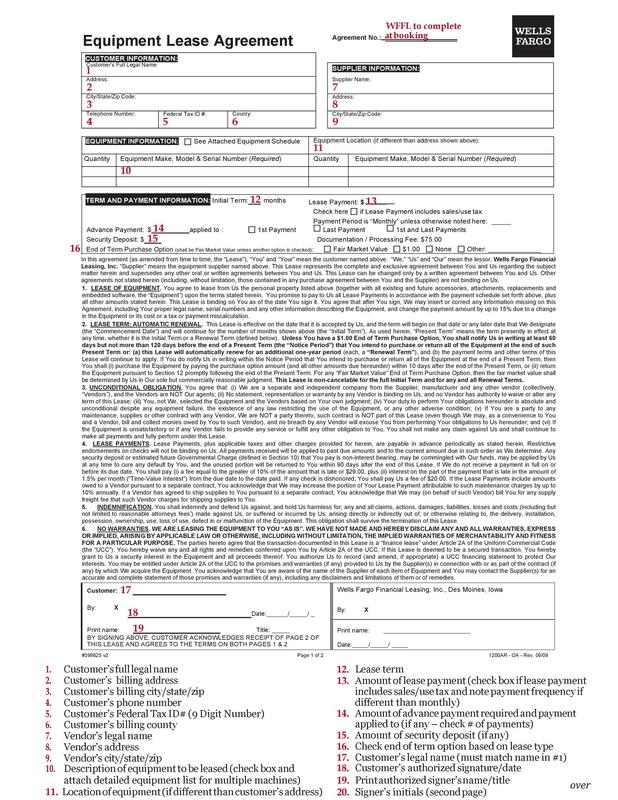 If the lessee is a company, authorized personnel must sign the document and affix the seal of the company on the document as well. 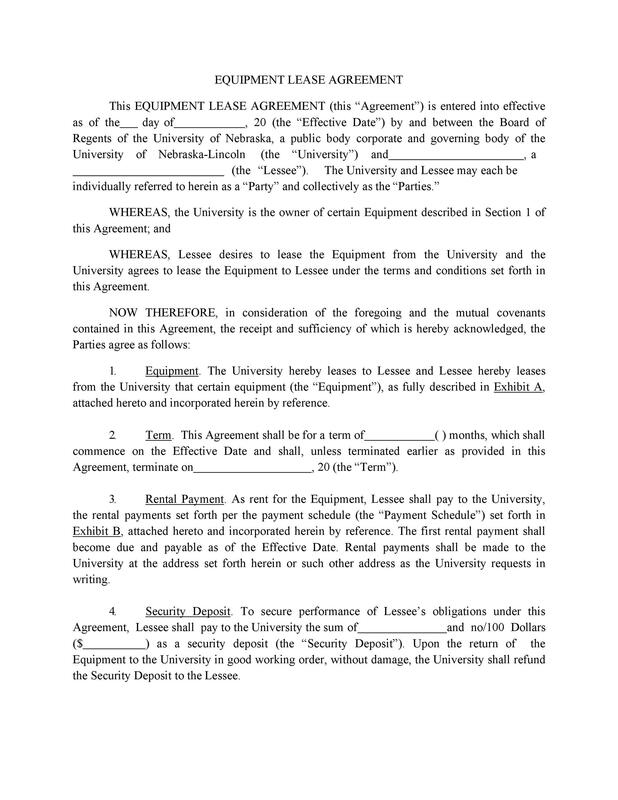 After the finalization of the equipment, the lessor must provide a copy of the lessee within two weeks. Both parties must keep the copies of the document in their record in case they’re needed in the future. 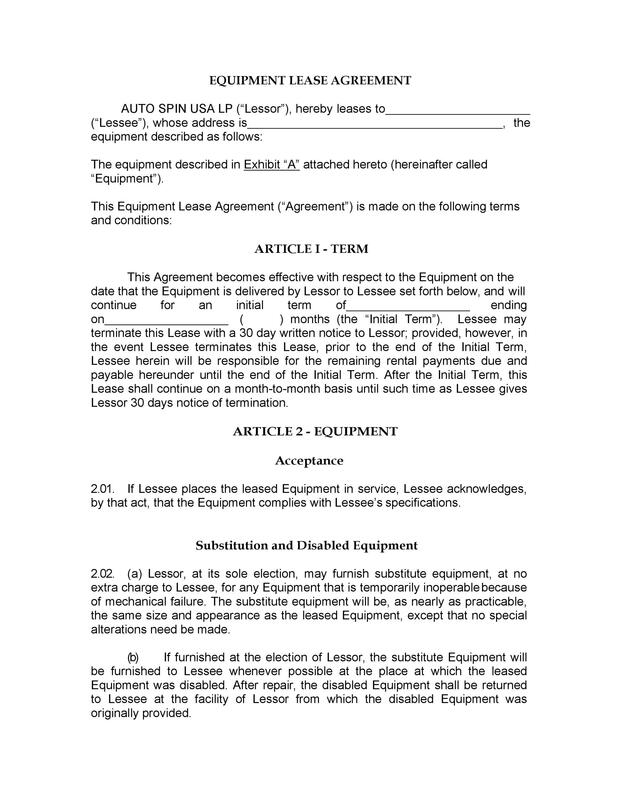 The lessor must also register the finalized agreement with the Equipment Leasing Registration Authority within 2 weeks after the lease commences. 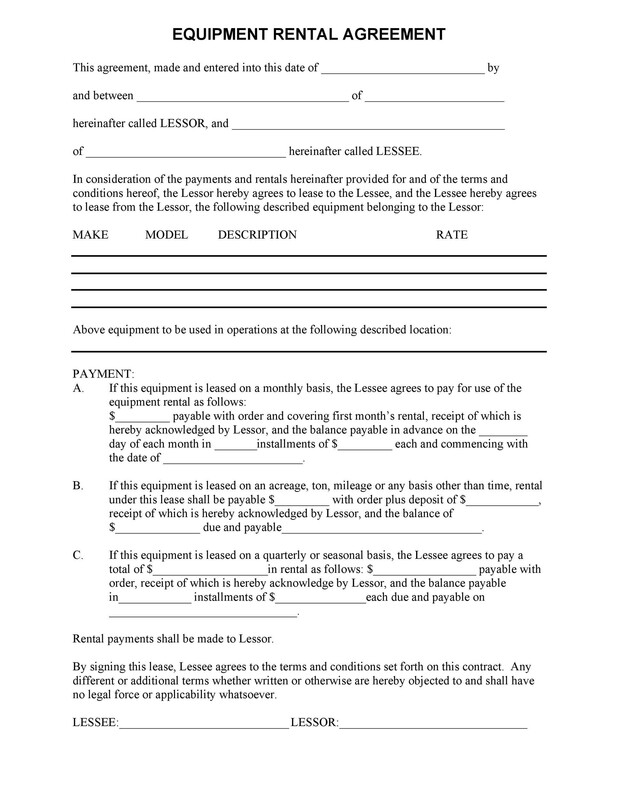 How to get out of an equipment lease agreement? 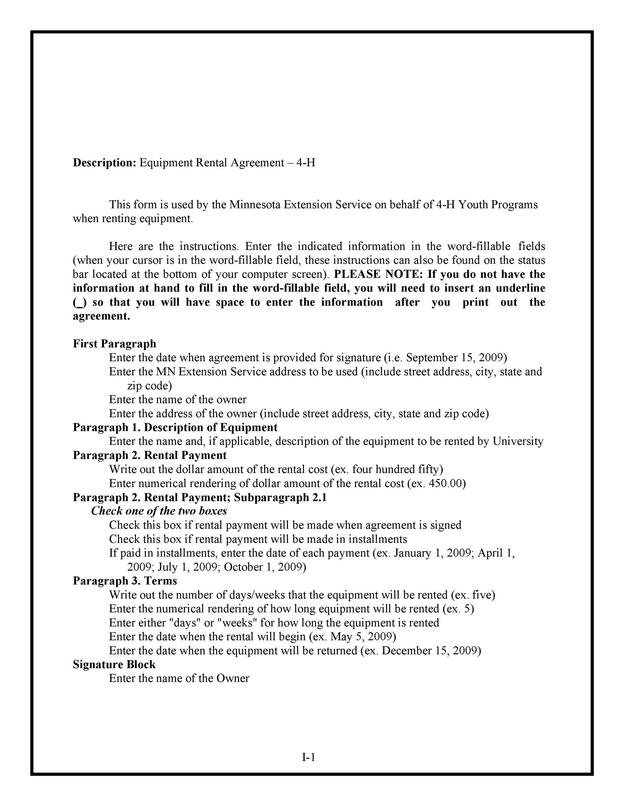 Go through the equipment lease agreement. Look for any escape clauses or loopholes. Although it may be quite tricky to find these, try looking for specific wording such as “in case of…” or “in the event of…” and more. 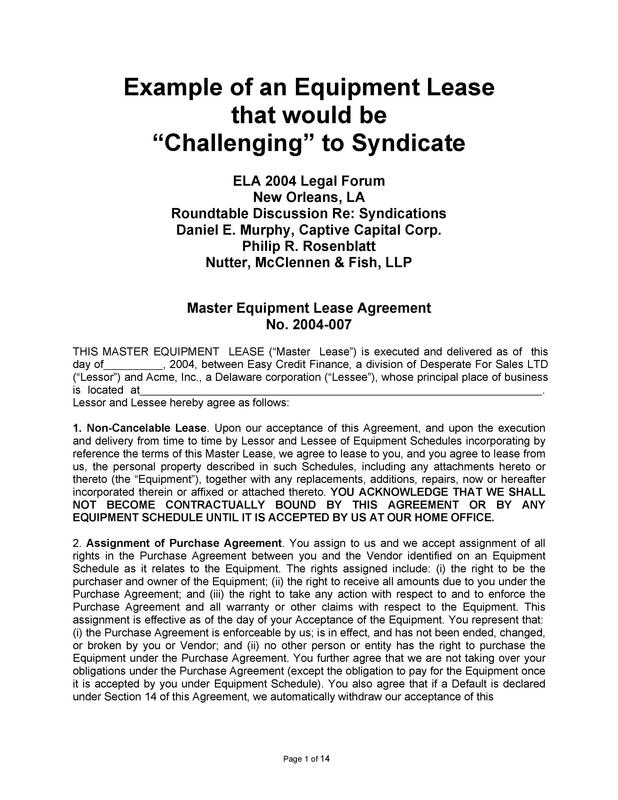 Learn the laws of your state regarding leasing equipment. Here, you may discover specific circumstances which you can use to get out of your agreement. Since every state has its own laws, you need to do some research. Consult with a lawyer. Although this isn’t a very economical method, a lawyer will know exactly how you can go about this. If your company has its own lawyer, provide the document and ask about your company’s options. 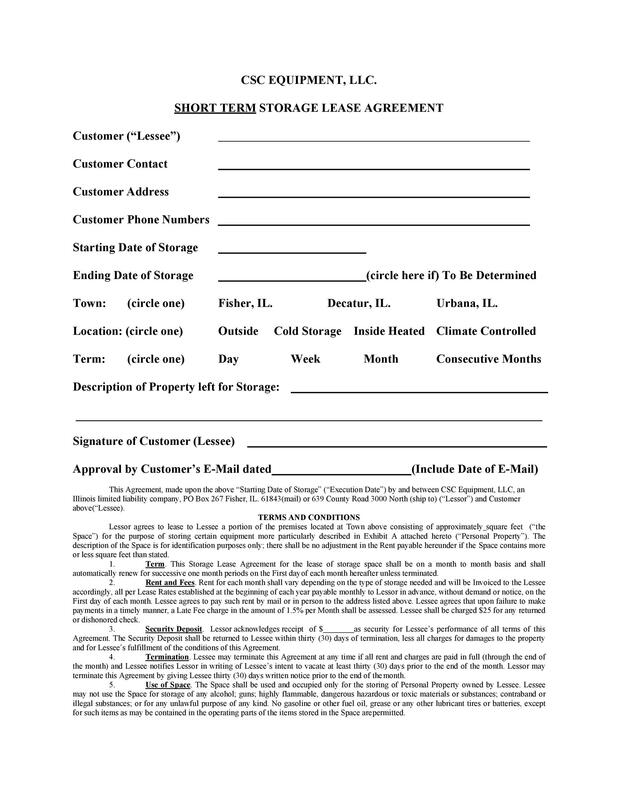 Come up with a document which states why you want to get out of your lease. 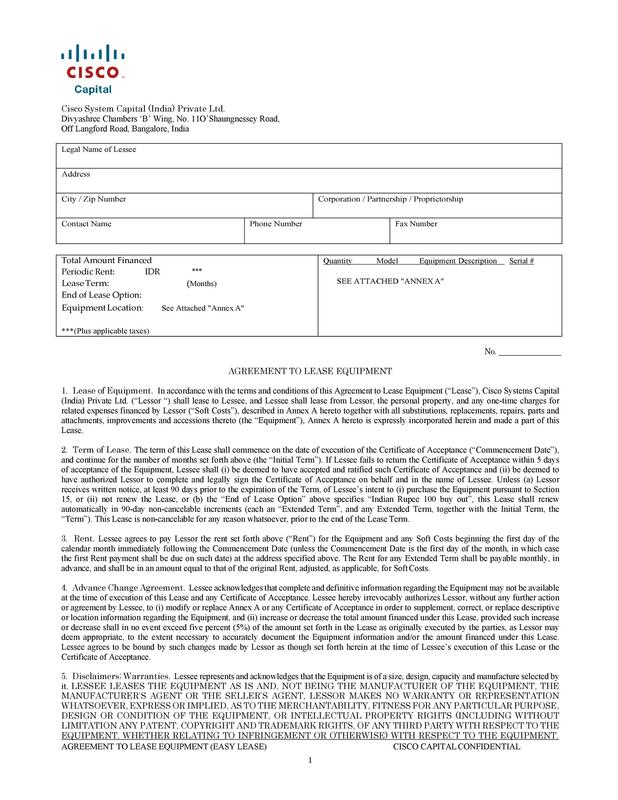 Attach any documentation or receipts which may prove your case to be genuine. This is especially effective for when you’re not satisfied with the equipment. 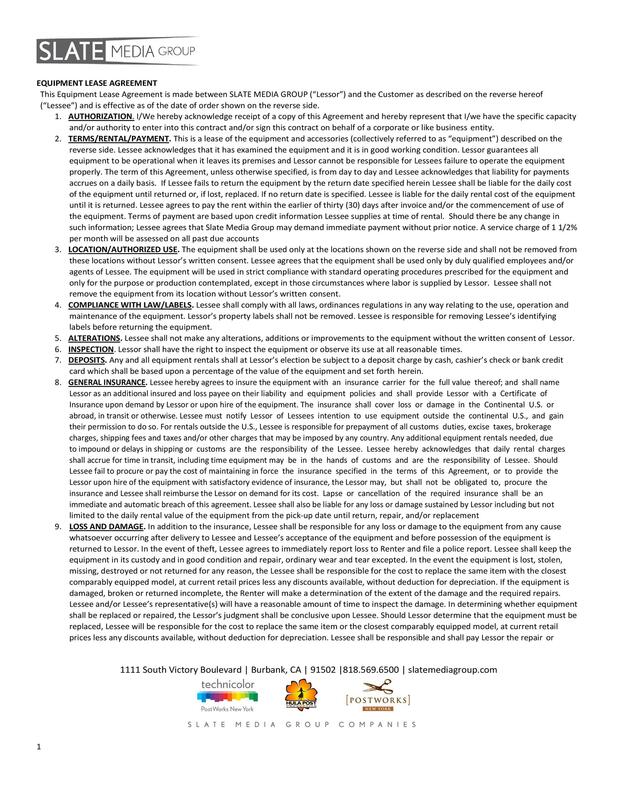 Inform the lessor of your plans to get out of the lease. Provide some evidence to support this decision. But only take this step after you’ve done all the other recommended steps.